It's been known for a while that restricting your diet will increase your lifespan, but now researchers have shown one reason why: Eating less causes your ribosomes (your cells' protein factories) to mutate. 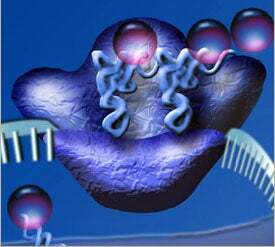 And it's looking like mutated ribosomes (pictured here) could be one key to life extension. The good news is that you may not have to starve yourself to mutate your ribosomes anymore. Biologists at the University of Washington have managed to induce the life-extending mutation in ribosomes with a drug that doubles the lifespan of yeast cells. In this project, the UW researchers studied many different strains of yeast cells that had lower protein production. They found that mutations to the ribosome, the cell's protein factory, sometimes led to increased life span. Ribosomes are made up of two parts — the large and small subunits — and the researchers tried to isolate the life-span-related mutation to one of those parts. "What we noticed right away was that the long-lived strains always had mutations in the large ribosomal subunit and never in the small subunit," said the study's lead author, Kristan Steffen, a graduate student in the UW Department of Biochemistry. The researchers also tested a drug called diazaborine, which specifically interferes with synthesis of the ribosomes' large subunits, but not small subunits, and found that treating cells with the drug made them live about 50 percent longer than untreated cells. Using a series of genetic tests, the scientists then showed that depletion of the ribosomes' large subunits was likely to be increasing life span by a mechanism related to dietary restriction — the TOR signaling pathway. The study will be published tomorrow in the journal Cell. Image via NSF.